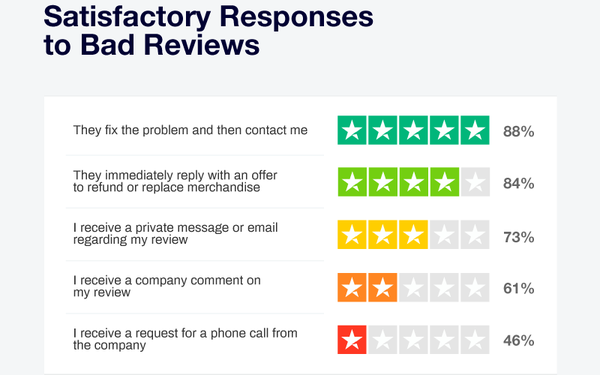 It may be hard to believe, but mostly, consumers write bad reviews online to be helpful, according to a new study from Trustpilot, an online review platform that publishes consumer comments goods and services. More than half in North America and Europe said warning “the online community” about a bad product/service/policy was reason enough to sound off. It has published 50 million reviews — a number that’s growing by 1.4 million a month — and the service gets 400 million Google impressions monthly. Trustpilot is now aggressively trying to make its mark in the crowded North American market. That mark, to be sure, has a pretty specific shape. “Consumers like stars,” Pardes says. Merchants all like four- or five star reviews. They all fear the opposite, which is why many businesses, big and small, are leery of consumer reviews. “We think one of the best benefits reviews can bring to a company are the SEO benefits. Because Trustpilot is a Google Review partner, companies using Trustpilot can rely on our reviews to improve their paid and organic search performance,” says Matt Malanga, senior vice president of marketing. After a certain number of positive Trustpilot reviews, a business can use those Trustpilot stars in Google AdWords listings. Trustpilot says seeing stars increases the chance a consumer will click on that listing by about 10%. To allay fears that Trustpilot is a play-to-pay operation, businesses can be included on Trustpilot without paying a dime, with the ability to see and respond to reviews. But for a fee, Trustpilot helps its member businesses prepare email solicitations to consumers to post reviews, gives tips on how to showcase the Trustpilot “TrustScore” and gives those businesses the right to post their star ratings on their own websites and in other material. Pardes, who shuttles between the Copenhagen headquarters and the Trustpilot office in New York, says that generally speaking, a close-knit European sense of community affects how reviewers deal with companies that get rated. But he says that spirit seems to be bending these days. By and large though, people who post reviews seem more altruistic than the common perception might suggest. For example, among North American consumers, 66% say they post positive reviews to “reward” the goods provider/service. In Europe only 43% say that’s one of their goals. This survey points to another consumer attitude worth noting: How eagerly consumers want a response to their criticism. Eighty-eight percent of respondents said the very best way to respond to a negative review is to fix the problem and then tell them what was done. But 61% said that just getting a response to their complaint would be reward enough. Still, on the flip side, 25% of people who get an inadequate response say they will take action to get a refund; 33% say they will edit their review to note the lack of a proper response; and 69% say they won’t shop at the poorly responding retailer anymore.